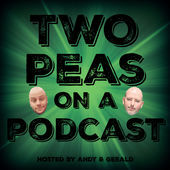 Gerald and Andy are joined by Ashlee from the Rabbit Ears TV podcast. We discuss and compare our top 5 science fiction TV shows of all-time. Don’t listen to this one alone. I’m just kidding, you can it’s not scary at all. Enjoy and share! Find our guest, Ashlee on Twitter @RabbitEarsTVPod or online via Podiant HERE. This Top5 episode topic was hand-picked by one of our Patrons via Patreon. Please consider being a Patron of our show by visiting us on our Patreon page. Much love & thanks. Intro: “She Blinded Me With Sciene” by Thomas Dolby. 1982 Capital Records. All Rights Reserved. Outro: “X-Files (Theme)” by The Dark. ℗ 2007 DPM Records. All Rights Reserved.